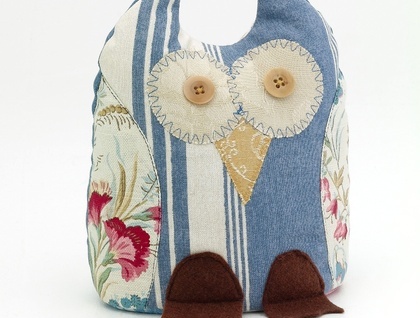 Ollie is made from Laura Ashley Upholstry grade fabric with a Stripe and floral print. The colours in the print; denim blues, natural a little bit of red, sandy brown, greens on a off white linen background. His front is made from striped blue/natural stripes that match the floral/stripe print exactly. He has a goldish yellow beak and Chocolate feet, Whooo loves Ollie?